On 2 March 2016 somebody sent me a link to an article on Facebook about Einstein, but which I could not access. The article is in the box below. The article was originally posted about 10 years ago on whitecivilright.com, a deceptive website run by David Duke, a phony White Suprematist secretly working for the Jews (I have more information about that issue here and here). 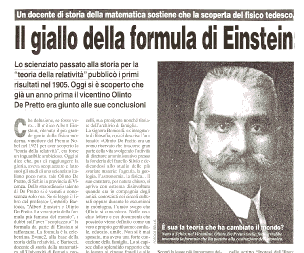 That was a time when Jews tried to do a lot of damage control because information about Einstein's plagiarism was spreading around the Internet after some researchers, such as Italian professor Umberto Bartocci, found evidence that Einstein was a plagiarizer. You might find the article below to be interesting as it adds some details to what I posted years ago here and here, and gives some insights into Einstein's disturbing personality. Google, Facebook, YouTube, Yahoo Answers, etc, systematically censor or hide information about the Jewish crime network, with the help of hordes of Jews patrolling the Internet forums and message boards (e.g. in these YouTube messages). They try to manipulate us by whining about "anti-semitism", "racism", "hate", and "politically correctness". They also selectively claim copyright infringment to prevent certain information from circulating, such as the TV program that showed a Jew trying to smuggle diseased eucalyptus leaves into Australia. (I made this 22 mb wmv video about it.) They also cause trouble for us without any justification or excuses, such as when Yahoo took down my website EricHufschmid.net. So it is up to you to spread this information and inspire other people to learn about what is going on and become an active participant in improving the world. Albert Einstein is today revered as “the Father of Modern Science”. His wrinkled face and wild hair has become a symbol for scientific genius and “his” famous E = mc2 equation is repeatedly used as the symbol for something scientific and intellectual. And yet there has for years been mounting evidence that this “Father of Modern Science” was nothing but a con man, lying about his ideas and achievements, and stealing the work and the research of others. This raises the question: “What sort of man was Einstein?” Is there evidence that he may have been prone to unethical behavior? One website reports “Einstein… was still far from the ideal husband. A year before they married, Maric gave birth to a daughter, Lieserl, while Einstein was away. The child’s fate is unknown – she is presumed to have been given up for adoption, perhaps under pressure from Einstein, who is thought to have never seen his first born. After the marriage, Mileva bore two sons but the family was not to stay together. Einstein began an affair with his cousin Elsa Lowenthal while on a trip to Berlin in 1912, leaving Mileva and his family two years later. Einstein and Mileva finally divorced in 1919, but not until after Einstein sent his wife a list of ‘conditions’ under which he was willing to remain married. The list included such autocratic demands as ‘You are neither to expect intimacy nor to reproach me in any way’. The historic record is readily available and the truth is known to many scientists and historians, even if they are afraid to say anything. The idea that light had a finite speed was proven by Michelson and Morley decades before Einstein. Hendrik Lorentz determined the equations showing relativistic time and length contractions which become significant as the speed of light is approached. These gentlemen along with David Hilbert and Olinto De Pretto have been airbrushed out of the picture so that Einstein could be given the credit for what they had done. Einstein was a minor contributor at best and in any case an intellectual thief and pretentious braggart. Einstein was still alive when Whitaker’s book was published and he said NOTHING about it. No libel suit, no refutation, no public comment at all. Some university professors have stolen work from their graduate students and it would be interesting to see if any of Einstein’s students complained of such thievery. A plagiarist seldom stops plagiarizing especially when he keeps getting away with it. Complaints against Einstein however seem to disappear down the Orwellian memory hole. Einstein is clearly a sacred cow to many. A few have even used the word “heresy” to describe serious well-documented criticism and charges of plagiarism against Einstein. The truth eventually wins out and Einstein will someday be best known as a great fraud instead of a great physicist.